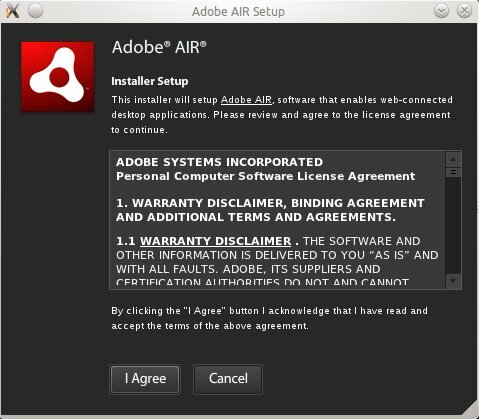 Go to http://get.adobe.com/air/ to download a Adobe AIR Installer package. I did install from a .bin package so i shall write about installing it from a .bin package. Actually, i would explain a bit about how to install it from a .deb package as well. Option One – If you downloaded a .bin package, run chmod command to make it executable first. Option Two – If you downloaded a debian package i.e. AdobeAIRInstaller.deb run the following command. Rest of the installation process is going to be same for any of .bin or .deb. Following any one of the two options above, installer should launch to begin installation. Once you click “I Agree” the installation starts immediately. The installation should finish within a few seconds and should ask you to click on “Finish” button. Just click it and Adobe AIR installation will be done. Now it’s time to install a .air application. It’s as easy as opening a file. Right click any *.air file and select Open With > Adobe AIR Application Installer and click Ok. Your .air application should install and launch just fine.